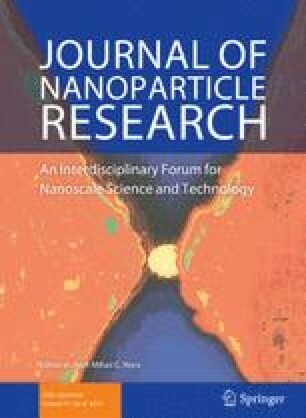 Nanoparticle physicochemical properties such as surface charge are considered to play an important role in cellular uptake and particle–cell interactions. In order to systematically evaluate the role of surface charge on the uptake of iron oxide nanoparticles, we prepared carboxymethyl-substituted dextrans with different degrees of substitution, ranging from 38 to 5 groups per chain, and reacted them using carbodiimide chemistry with amine–silane-coated iron oxide nanoparticles with narrow size distributions in the range of 33–45 nm. Surface charge of carboxymethyl-substituted dextran-coated nanoparticles ranged from −50 to 5 mV as determined by zeta potential measurements, and was dependent on the number of carboxymethyl groups incorporated in the dextran chains. Nanoparticles were incubated with CaCo-2 human colon cancer cells. Nanoparticle–cell interactions were observed by confocal laser scanning microscopy and uptake was quantified by elemental analysis using inductively coupled plasma mass spectroscopy. Mechanisms of internalization were inferred using pharmacological inhibitors for fluid-phase, clathrin-mediated, and caveola-mediated endocytosis. Results showed increased uptake for nanoparticles with greater negative charge. Internalization patterns suggest that uptake of the most negatively charged particles occurs via non-specific interactions. The online version of this article (doi: 10.1007/s11051-013-1874-0) contains supplementary material, which is available to authorized users. This work was supported by the US NSF (CBET-0609117, OIA-0701525) and tNIH (1 R15 EB010228-01). We acknowledge the use of the Integrated Advanced Microscopy facility at the Cornell Center for Materials Research (CCMR) supported by the NSF-MRSEC program (DMR 0520404) and are grateful to Prof. Juan Hinestroza and Alejandra Andere for performing TEM measurements. We acknowledge the use of the UPRM microscopy facility and the help of Mr. Jose Almodóvar in the CLSM measurements.